This is a photodigital of the bottom of the first page of a work to make an alphabet based on prechosen subjects, objects, items. The alphabet is called Blue Bird (AB Blue Bird)–Butterflies, Lipizzon, Unicorns, A warrior stance recognizable by an Atari arcade game character in Gauntlet Legends-Blue Valkryie, Rainbows, Dolphins. Using these subjects I had to pick an icon that would stand-in for the English letter “A.” I picked horse’s ear. But the ear by itself does not show the horse. Going that direction, how much around the head do I show, that I can draw, but highlight the ear. If the head comes into play I should have that understanding. With that, I am here working on the understanding of the drawing of the head. 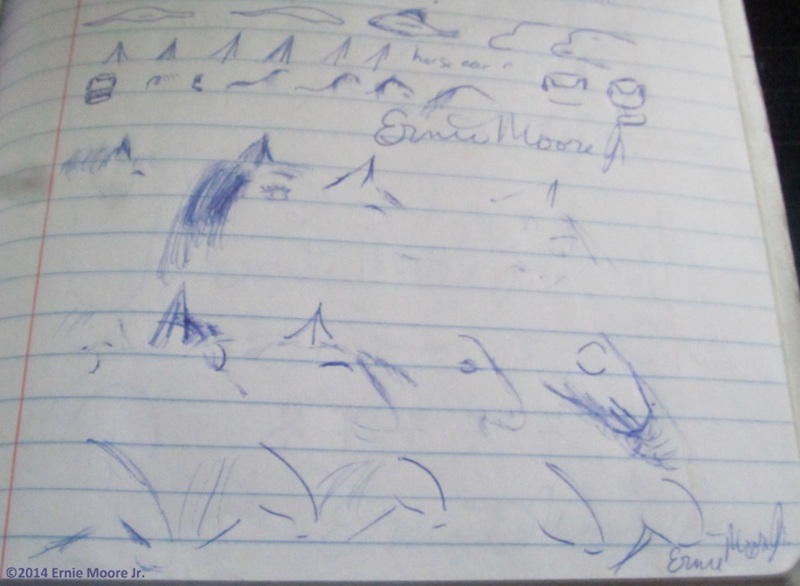 At the top is my studying dolphin shape.-Ernie Moore Jr.